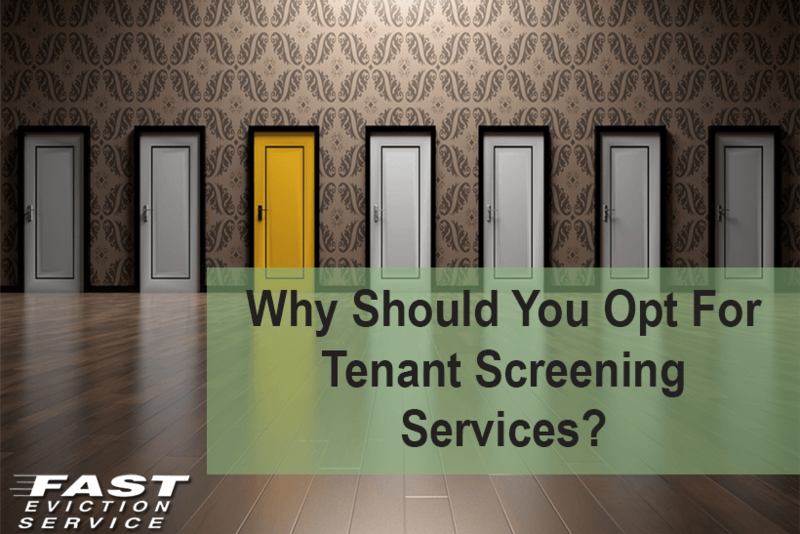 Why Should You Opt For Tenant Screening Services? As a landlord, it is your responsibility to run quick tenant background checks on prospective tenants before signing an agreement with them to rent your place. This eliminates any doubt regarding their ability to pay the rent and sheds light on the kind of tenant they previously were, and whether they would be suitable for your property. Most of the time landlords do not have the time or do not make the effort to run a background check, even after asking for references. Here is where a tenant screening service provides its very first benefit to you. They run a complete background check on tenants for minimal fees and can ask around about them and provide you complete information regarding anything you may want to know about your prospective tenant. Many times landlords may rent their property out on referral basis and again fail to run a background check or obtain information about a tenant’s creditworthiness. This may lead to problems further on. To avoid such an occurrence, it is advisable to opt for tenant screening services that take the hassle off your shoulders and help you in making an informed decision. Tenant screening service providers are professionals and experienced in their field and along with running a background check on creditworthiness and other aspects of a tenant, they check the criminal record of the prospective tenants. As a landlord, you would not want a tenant who uses your property illegally or has been convicted before for legal wrongdoing. It will cause immense trouble for you and your property if you hire such a tenant by mistake. To avoid any nuisance with such tenants, it is important to check their criminal record as well, and that is done by tenant screening services. You can also access and read thorough the tenant information report provided by these tenant-screening services. As a landlord, you may be too busy in your work and responsibilities that you may not want get the time to properly screen through tenant applications. Tenant screening services help you by taking the responsibility from you and doing background checks on prospective tenants. In this way, a landlord can save their time and effort to sift through applications or interview tenants for the agreement. As a landlord, you may have your own preferences and criteria of choosing a tenant. You can discuss these criteria with tenant screening services, and obtain a customized tenant screening report. A tenant may sue you for discrimination in case of rejection. To avoid such situations, you may incorporate such terms in your rental agreement, which would eliminate any chances of tenant objection when refused. Tenant screening services will help you obtain this customizable tenant screening form, which will make it easier to sift through applications and eliminate the chances of any trouble. There are now several online websites that provide a variety of Tenant Background Checks you may want to investigate. You will want to ask any prospective agency offering tenant screening services what they can offer you can’t obtain yourself online on these sites. In case of a problematic tenant, eviction services are helpful and they may help, you get rid of an unwanted tenant but it is always advisable to screen through tenant applications carefully in the first place.